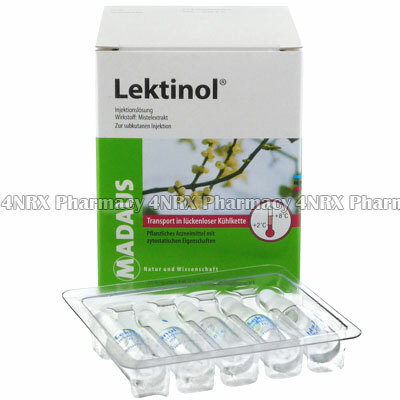 What is Lektinol Injection (Mistletoe Extract) used for? Mistletoe Extract is a phytotherapeutical product with good potential in the treatment in cancer patients. Mistletoe Extract may improve quality of life during chemotherapy and increase chances of survival in patients with cancer. Mistletoe Extract contains several pharmacologically active substances including mistletoe lectins, viscotoxins, flavonoids, terpenoids, alkaloids and amines. Mistletoe Extract shows good potential as an anticancer agent because extracts and their constituents (primarily lectins and viscotoxins) have been shown to kill cancer cells in vitro, to stimulate immune system cells both in vitro and in vivo, and to have other mechanisms of action, such as antiangiogenesis. In view of mistletoe`s ability to stimulate the immune system through induction of several cytokines and activation of lymphocytes, granulocytes and phagocytes, it has been classified as a type of biologic response modifier. How should I use Lektinol Injection (Mistletoe Extract)? Lektinol comes in a box of 25 ampuoles. Each ampuole contains 0.5mL of liquid for subcutaneous injection. Mistletoe Extract is most commonly administered via subcutaneous injection. Common regimens involve 2 to 3 injectons weekly. Check with your doctor about the best dosage for your condition.